The Synonym Editor is available from Developer Studio. It provides the following tabs that enable you to view and manage synonyms: Field View, Segment View, List View, Modeling View, Text View, and Access File Text View. The Field View tab and Segment View tab show a hierarchy of segments and columns on the left with the attributes and values of the selected item in the Properties window, which displays by default on the right side of the tool. The Properties pane and the other available panes (Business View, Dimension Builder, or DBA) can be resized, positioned in different areas, or hidden by the available toolbar icons. The following image is an example of an SQL data source with a key column selected. Information about the selected attribute is displayed at the bottom of the Properties pane. In this case, an explanation of the FIELDNAME attribute appears. The following objects may appear in the tabs. General icon used to indicate synonyms, visible on the left of the Field View tab. Provides information about the file name used and the application in which it resides. Indicates a segment in a synonym. The root or parent segment appears first in the tree. Unique Segment (FOCUS/FDS and XFOCUS only). Indicates a unique segment in a FOCUS/FDS or XFOCUS synonym. Indicates a virtual or cross-referenced segment. The icon is dimmed. This type of segment is applicable to FOCUS data sources. Indicates a virtual or defined column. For more information about virtual columns, see Adding Virtual Columns (DEFINE) in a Synonym. Indicates that the native DBMS has an index for quick retrieval of values for this field. Indicates a Master File filter. This option is enabled when you select Options from the Tools menu. In the Options dialog box, click the check box for Support extended options. The Synonym Editor toolbar contains buttons that provide quick access to commonly performed functions. The behavior of the button is determined by the selected object. Therefore, certain toolbar buttons may be inactive. Saves the edits made to the synonym. Saves the edits made to the synonym to a new file (Save As). Enables you to print the current view. References segment from an existing synonym. Enables you to add segments from an existing synonym. Enables you to add segments through the Segment via Metadata Import option using the Create Synonym tool. This tool creates a synonym and includes it as a segment in the synonym from which the tool was launched. Enables you to manually add segments, assigning values to segment attribute fields in the Synonym Editor. Use this approach only if you are coding a new Master File, as you would for a FOCUS data source. Adds a virtual column (DEFINE) field. Adds a Master File filter. For more information about filters, see Creating Filters in a Synonym. For more information about computed fields, see Adding Computed Fields (COMPUTE) in a Synonym. For more information about groups, see Adding Group Fields in a Synonym. Inserts a variable in the segment. Enables you to view and refresh sample data for the object. Enables you to add DBA security to a Master File. For more information about DBA security, see Applying Database Administrator Security. Enables a parent and child hierarchy in Dimension Builder. Enables you to create a Business View and a custom Master File that can use selected fields from the original synonym. In addition, you can customize field names, titles, and descriptions. Creates a default tree structure in the Business View and Dimension Builder panes based on existing segments and fields in the Master File. Enables you to undo or redo your actions. Provides a window with a compressed view of the synonym. Only available from the Modeling View tab. When you click Tools from the menu bar and select Options, the Options dialog box appears, as shown in the following image. It enables you to set preferences and customize the look of Synonym Editor. Specifies the maximum number of undo/redo operations allowed in the Synonym Editor. When you create a new synonym in the modeling view of the Synonym Editor with the Automatically detect new segment relations option selected and select or drag tables into the work area (modeling view). The relationships (joins) will automatically be created for you based on the foreign key information in the access file. The Format pane is available from the Options dialog box. To open the Options dialog box, select Options from the Tools menu. Expand the General node, and select Format, as shown in the following image. The Fonts section has the following fields and options. 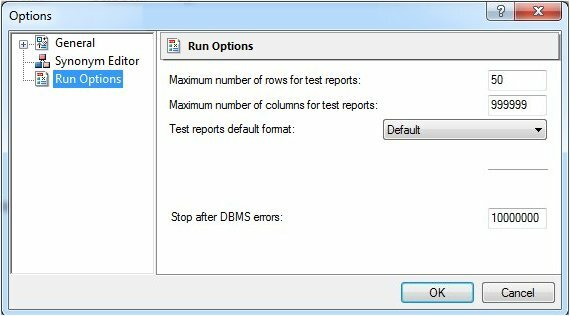 The Column Management pane is available from the Options dialog box. To open the Options dialog box, select Options from the Tools menu. Expand the General node, and select Column Management, as shown in the following image. Indicates a reference for the column to an index column. 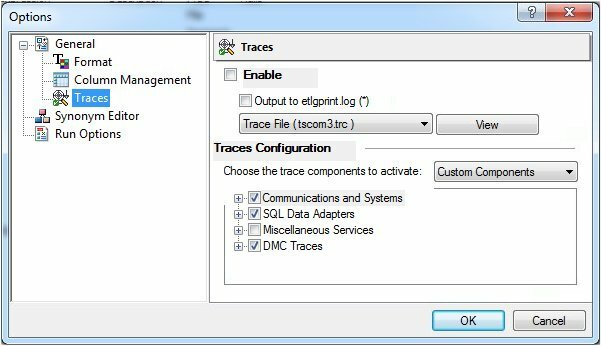 Trace option settings enable you to configure tracing for the server, as shown in the following image. When you right-click a segment in the Synonym Editor, the following context menu appears. This menu is available from the Field View and Segment View tabs. The following image is an example of an SQL data source with the root segment selected. Adds a reference pointer from the current synonym to an existing synonym. The selection list will show candidate synonyms as well as any synonyms that they reference. Data Profiling is available from the right-click context menu for all columns in the Master File hierarchy tree. Sample data is available throughout the Synonym Editor toolbar. The following image is an example of the sample data that appears for a segment. 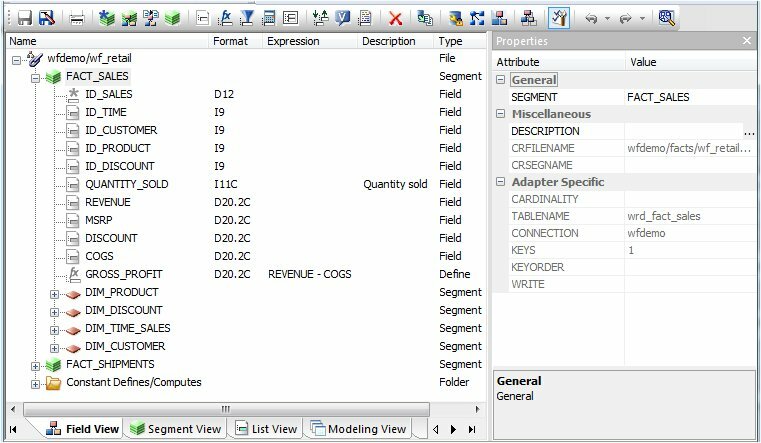 Allows you to edit adapter specific properties, such as the delimiter value in a delimited flat file. When you right-click a column in the Synonym Editor, the following context menu appears. This menu is available from the Field View, Segment View, and List View tabs. The following image is an example of an SQL data source with a column selected. Note: The options that are available will depend on the data source. Opens a pane showing the properties of the selected column. Inserts a general column to the synonym. Inserts a virtual or defined column to the synonym. Inserts a group column to the synonym. 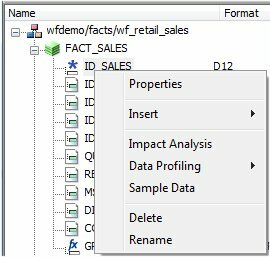 Displays an Impact Analysis report for the particular column in the workspace. An Impact Analysis report identifies the procedures that access a Master File or field within a Master File. For detailed information on Impact Analysis, see Analyzing Metadata and Procedures. 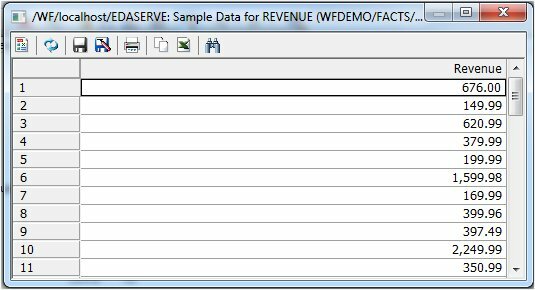 Provides the characteristics of the data for a column. Data Profiling is available from the right-click context menu for all columns in the Master File hierarchy tree. The following image is an example of the sample data that appears for a column. Decomposes date fields into virtual columns representing Year, Quarter, Month, and Day fields. Note: Decompose Date is only visible for date fields. Allows you to rename the column. The Field View tab shows a table with the available fields and segments. The following image is an example of a Microsoft SQL Server data source in the Field View tab. The row below the toolbar menu, which includes the Name, Format, Expression, Description, and Nulls, enables users to right-click and drag to move a column to the right or left, changing the column order in the display grid. You cannot move the Name column. Users can also customize visible columns by right-clicking the row and selecting Customize, as shown in the following image. The same menu displays when you right-click in an empty space. From this menu, a user is also given an option that enables them to switch views. More, the last option, opens the Column Management section of the Options dialog box. 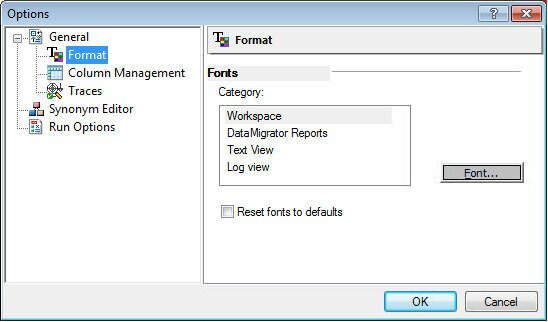 For more information, see Synonym Editor Column Management Settings. The Segment View tab shows the segments that the synonym contains. The following image is an example of a Microsoft SQL Server data source in the Segment View tab. The List View tab shows a list of objects on the left, with the attributes and values of the selected item on the right, as shown in the following image. Note: When you right-click a column heading in the List View, a context menu provides options to sort the display based on ascending or descending column values. The display can be sorted by any column. The Modeling View tab shows a graphical representation of the synonym. Use the Modeling View to create cluster joins, view join properties, and add or edit segments. 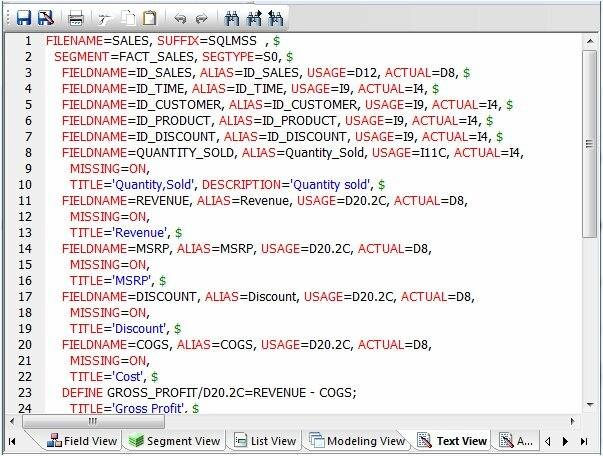 The following image is an example of an SQL data source in the Modeling View. In the Modeling View, when you right-click in an empty space, you are presented with tasks permitted in this view, for example, Insert a Segment and Auto Arrange available synonyms. For more information about the Modeling View, see Enhancing Synonyms Using the Modeling View. This view opens the synonym in the editor. You can print the Master File code by selecting Print from the File menu, perform search operations, and even make changes. The following image is an example of a Microsoft SQL Server data source in the Text View tab. The Access File Text View tab shows the description of the Access File for a synonym, which is used to access the database. Note: You can print the Master File code by selecting Print from the File menu, performing search operations, and making changes, if necessary. The following image is an example of an SQL data source in the Access File Text View tab.